On what device(s) you experience slow connection speed? If you experience slow connection on your wireless device(s) we did an article on how to improve your wireless connection available here. I was able to locate your account using your community details and ran initial tests. It shows your service connected for 3d 15h 13m and getting a passing speed on the line.. I refresh your service to our network try to re-run another speed test using desktop/laptop connected via LAN/Ethernet cable and post the test result on this thread. Tell me how it will go, cheers! Hi there thanks for the reply, i am still experencing slow upload speeds. i have posted my speed test results. i am not using wireless i am hardwired into the modem, download speeds are fine im just worried about the upload speed as i am a streamer for games and require a decent upload speed. Hi @paularchibald Have you changed any bandwidth control settings on the modem/router at all from the default values? No havn't changed any settings? are there certain settings i need to change? No settings should be changed from the defaults, I just thought I’d ask as some users have made things difficult to fault find by tweaking, it maybe needs a profile to be updated but that’s up to the techs to sort. I’ve got the same issue since yesterday. Upload should be 4MB, not 0.05. Thanks for posting your speed test result. 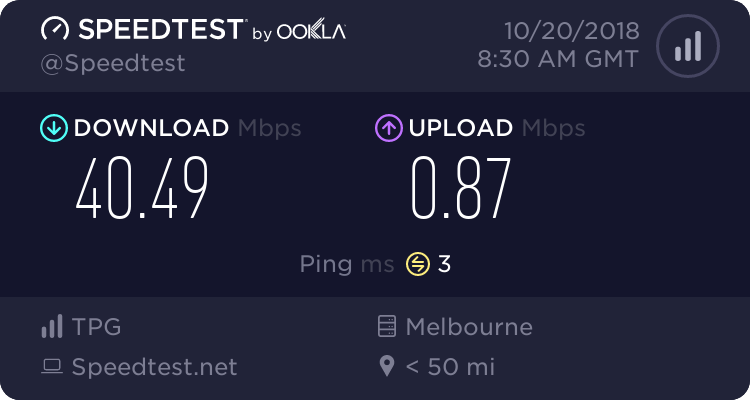 We weren't able to detect any fault on the NBN network, but the upload speed is very low. We'd like to look into it further. We will arrange a call from our Tech team to help us with the investigation. Please shoot me a private message with your preferred time and best number to be contacted. Thanks for raising this with us. We'd like to assist in the best possible way we can. I tried searching for your account using your community details, but unable to find a match. Please shoot me a private message with your TPG username or CID number. I understand that our Tech team has been in touch and the case was escalated to our Engineering team for further investigation since troubleshooting has been done. Any updates with the case will be given by the assigned engineer for your case. My TPG account name has been sent to you via private message.